No one of a certain age will ever forget the events of October 1980, as the Phillies won their first and only World Series title behind future Hall of Famers Mike Schmidt and Steve Carlton, the legendary Pete Rose, and beloved Phils icons such as Larry Bowa, Garry Maddox, Greg Luzinski, and of course, Tug McGraw. The magical, fun, worst-to-first 1993 team that went to the World Series before losing on a legendary homerun by Joe Carter of the Toronto Blue Jays off Phils' closer Mitch Williams is unforgettable as well to even more fans. That cast of characters led by Darren Daulton, Lenny Dysktra, Curt Schilling, and John Kruk will be spotlighted later this week. There are even some old enough to remember with fondness all the way back to Richie Ashburn and Robin Roberts leading the 1950 Phils up against the Yankees dynasty before falling short, losing 3 of the 4 games by just one run. 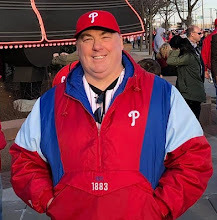 But somewhere along the way, somehow since it doesn't happen very often, the Phillies appearance in the 1983 World Series seems to be lost in the memory banks of many fans. It remains to this day, sandwiched between that 1980 magical title and 1993 near-miss, the forgotten series to Phils fans. That '83 Series matched the Phils against the A.L. champion Baltimore Orioles. Back in those days, the O's were regular contenders in the American League east division. From 1966 through that 1983 season, the O's enjoyed their 'Glory Days', winning three World Series in this span, six A.L. pennants, and also winning 5 of the first 6 east division titles. Three of the O's players won MVP awards in this span, and their pitchers won six Cy Young Awards. It was a great organization, and the 1983 team was typical. Led by future Hall of Famers Jim Palmer (in his final full season), Eddie Murray and Cal Ripken Jr (a rookie that year), the Orioles won 98 games in the regular season. The Phillies that year had the oldest average player age in the big leagues. At an average of 32 years old, that Phils team was nicknamed the 'Wheeze Kids' by the media, a pun hearkening back to that 1950 team whose youth earned it the legendary moniker of 'Whiz Kids'. Schmidt, Carlton, Rose, Maddox, reliever Ron Reed, and pinch-hitter Greg Gross were still around from the '80 world champs. They were joined by former all-stars and Rose' former fellow 'Big Red Machine' mates Joe Morgan and Tony Perez. Also starring on that club were outfielders Gary Matthews and Von Hayes. and pitchers John Denny (who won the Cy Young that year), Al Holland, and Larry Anderson (the only Phil to play on the '83 & '93 Phils Series squads). A young Juan Samuel came off the bench that year to provide speed and spark. The Phillies jumped out to a 1-0 lead in the Series thanks to an 8th inning leadoff homerun by Maddox, after Morgan had tied the game with a 2-out homerun in the 6th. Denny tossed 7 2/3 strong innings, allowing just 5 hits, and Holland finished up for the save in the 2-1 victory. In Game #2, the O's got another pitching gem from Mike Boddicker, who had won the ALCS MVP, and took the contest by a 4-1 score to tie the Series at 1-1. But the Phils felt good. They had split in Baltimore, and would now return to Philly for the next three games in Veteran's Stadium. Game #3 was a gem tossed by Steve Carlton. 'Lefty' took a 2-1 lead into the 7th inning thanks to solo homers by Morgan and Matthews, and appeared to be cruising as he got the first two outs. But the O's longtime team-leading catcher Rick Dempsey, who would end up taking the Series MVP award, smacked a double, and a pinch-hitter brought him home as the tying run with a single. Holland came in to relieve, gave up another hit, and an error by shortstop Ivan DeJesus brought home the go-ahead run. The sequence would prove to be a Series turning point, as the O's nailed down the 3-2 win despite mustering just six hits, taking a 2-1 Series lead. In Game #4, the bats broke out as each team clubbed ten hits. The Phils again took the lead, this time by 3-2 heading into the 6th, but Phils reliever Willie Hernandez suffered a 2-out meltdown that resulted in the go-ahead runs. An insurance run in the 7th proved pivotal, as a Phils 9th-inning rally fell just short in a 5-4 loss that put the Orioles within one win of a title. For the vital Game #5, the Phils sent young righthander Charles Hudson to the mound. But it wasn't the kid pitcher that did the club in, it was the non-existent bats. The Phillies managed just five hits, and Eddie Murray snapped out of a Series-long slump with a pair of homeruns to seal the Phils fates. Baltimore won the game in a 5-0 shutout in front of a dispirited crowd at The Vet, taking the Series by four games to one. Then young and a rookie players, but soon to be a record-breaking legend, Cal Ripken Jr recorded the final out, and the O's celebrated on the turf at The Vet (pictured above). The Phillies would not return to the World Series for a decade. Worse days were ahead though for the O's who have not returned to the Series since that day. Phillies legend Paul Owens had taken over the reigns of the club that year during the season, and had guided the 'Wheeze Kids' to the World Series in what remains for many the forgotten World Series in Philadelphia.